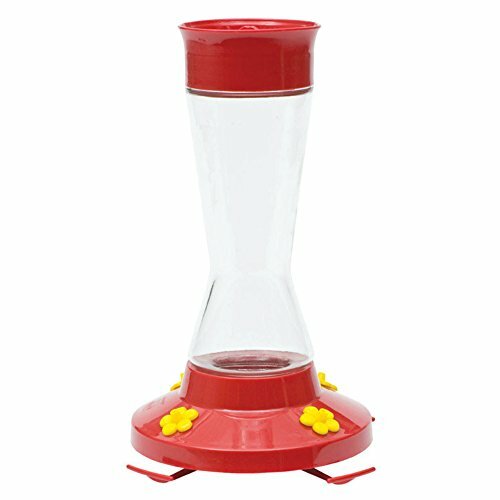 Perky-Pet 16 oz Pinch Waist Glass Hummingbird FeederCategory: Pinch Waist Glass FeederThe Perky-Pet Pinch Waist Glass Hummingbird Feeder has everything you need to attract hummingbirds to your yard. The 16-ounce nectar capacity holds just enough to make sure there's always fresh, clean nectar for your tiny hummingbirds. The wide mouth opening on the glass feeder bottle makes filling mess-free and cleaning simple. The built-in bee guards on the four feeding ports protect the nectar supply and your hummingbirds from bees. The built-in ant moat on the lid keeps ants away. Simply fill with water! 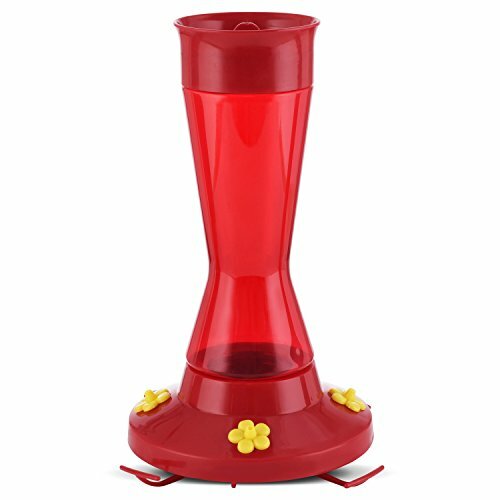 Perky-Pet 8 oz Pinch Waist Glass Hummingbird FeederCategory: Pinch Waist Glass FeederThe bright red base and flowers of the Perky-Pet Pinch Waist Hummingbird Feeder will attract the tiny hummingbirds to your yard! 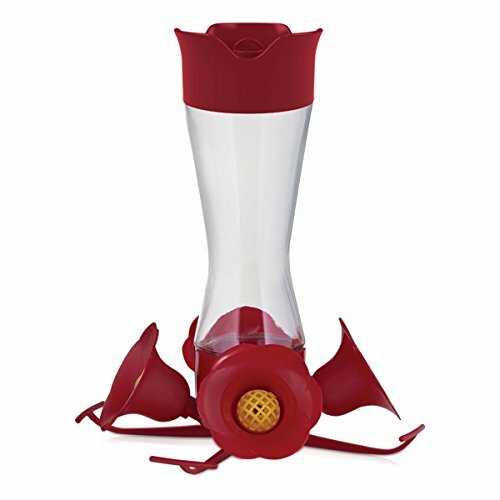 The wide mouth opening on this glass bottle makes filling your feeder easier and mess free. 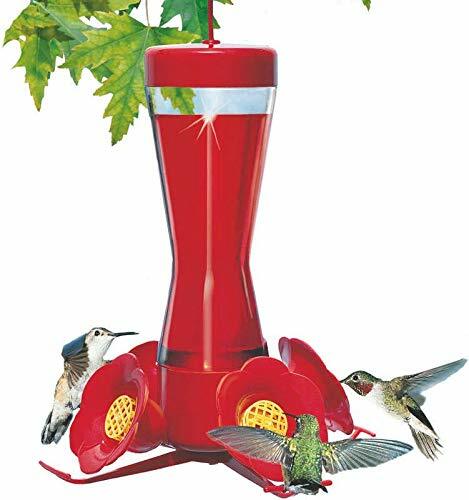 The eight-ounce nectar capacity is the perfect size to ensure that your hummingbirds always have the freshest of nectar. Complete with a built-in ant moat and bee guards, pesky bees and ants will never be an issue for you with this feeder! Simply fill the ant moat on the lid with water and ants won't be able to crawl down the feeder and get into the nectar. 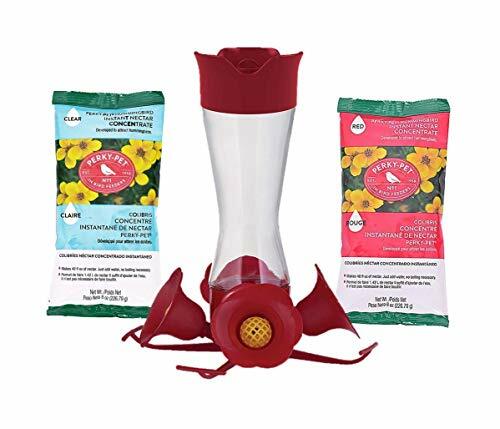 Pennington Ecozebo Wild Bird Feeder, 7 Pound Seed CapacityCategory: Pinch Waist Glass FeederThe Pennington EcoSmart Ecozebo Wild Bird Feeder holds up to 7 pounds of wild bird seed and features a chew-proof hanging cable. Its roof and base are made of 100 percent recycled material, and variations in the recycled material will give each feeder a unique look. This easy-to-fill feeder can mounted by pole or hanger and comes ready to hang! You'll love attracting birds like chickadees, finches and nuthatches to add life and color to your backyard. 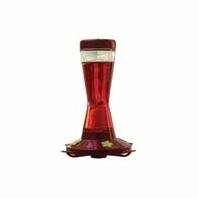 Perky-Pet 12 oz Elegant Copper Glass Hummingbird FeederCategory: Pinch Waist Glass FeederThe Perky-Pet Elegant Copper Hummingbird Feeder will add sophistication to your yard while providing a luxurious stop on a hummingbird's lengthy journey. This new and improved feeder has a wide mouth opening to make filling and cleaning your feeder easier than ever. The brushed copper base now comes apart into two pieces so that cleaning is quick and simple. Built-in bee guards on the four flower feeding ports protect the nectar supply from bees. The 12-ounce capacity will ensure there is always enough nectar to go around. Perky-Pet 24 oz Red Square Antique Bottle Glass Hummingbird FeederCategory: Pinch Waist Glass FeederThe Perky-Pet Red Square Antique Bottle Hummingbird Feeder features a vibrant red antique bottle and a brushed copper base. The hardened glass nectar reservoir has a unique square shape and holds 24 ounces of nectar. Hummingbirds will flock to feed from this feeder's four decorative flower feeding ports. The base easily comes apart and reassembles for easy cleaning. STOKES SELECT LINCOLN TAPERED GLASS FEEDER 2 CT.Category: Pinch Waist Glass FeederSTOKES SELECT LINCOLN TAPERED GLASS FEEDER 2 CT.
Sunjoy 110309035 Glass Bird Feeder Garden Stake, 3200750Category: Pinch Waist Glass FeederThis colorful Sunjoy Glass Bird Feeder Garden Stake serves multiple purposes, providing a touch of beauty and art to your garden or patio and also drawing small birds and butterflies to your yard for a snack or a bath. The stake features two lovely iridescent glass plates. 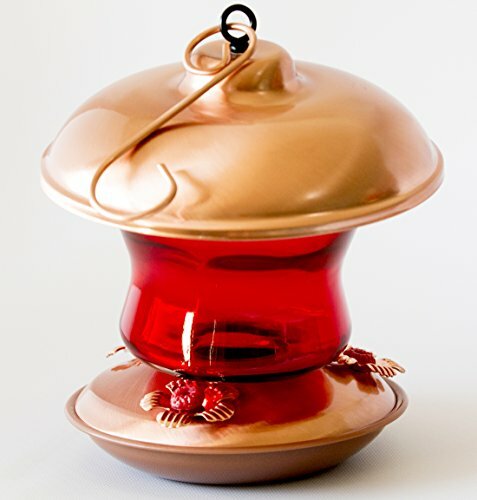 The bottom tray, painted in a glorious pink, functions as either a bird feeder or bath and the top, painted in teal and yellow, is an additional feeder. Simply add jelly, a nectar-soaked sponge or pieces of overripe fruit and enjoy the songbirds that come to visit. This ornate stake is adorned with amber, pink, blue and green glass orbs affixed to the sturdy iron rod, giving this delicate piece of art a whimsical appeal. By flushing the tray with water, the bird feeder is incredibly easy to clean. Do not put in a dishwasher. The bird feeder garden stake itself features a three-prong base for easy placement in the ground. 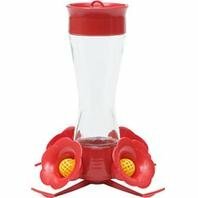 Perky-Pet 8 oz Pinch Waist Plastic Hummingbird FeederCategory: Pinch Waist Glass FeederThe Perky-Pet 8 oz Pinch Waist Plastic Hummingbird Feeder holds up to eight ounces of nectar. 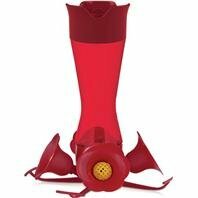 This hummingbird feeder features a red plastic bottle with a pinched waist and a wide mouth for easy filling and cleaning. The feeder's design also includes four flower-shaped feeding stations, each with a resting perch and a built-in bee guard to protect the nectar supply. The feeder also comes with a built-in ant moat on the top. Simply fill with water to keep ants away. 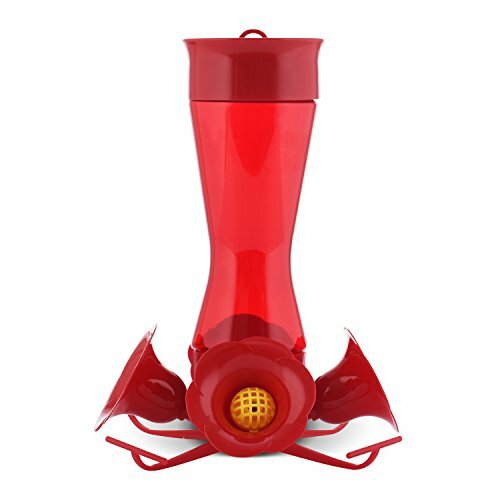 In addition to its wide-mouth opening, this hummingbird feeder's base and ports come apart to ensure convenient access and thorough cleaning. The bee guards also snap open, making washing the feeder easier. 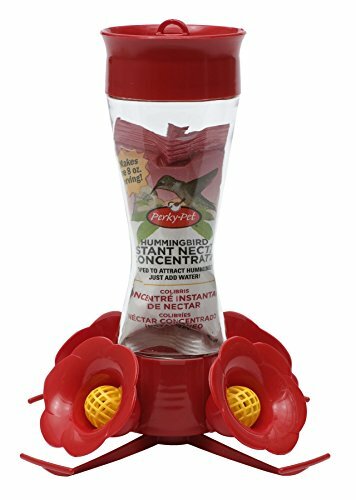 This feeder comes with a free 1.3-ounce packet of instant nectar concentrate, which makes the perfect amount of nectar to fill this feeder.